Each drummer has different demands that dictate the choice of accessories. If you need help with your selection, check out our practical guide – it will save you time and money. 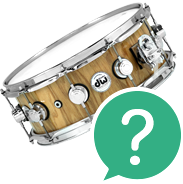 If you'd like to consult with an expert on drum accessories, call us at 800 100 029 (Mon-Fri, 9 a.m. - 8 p.m., Sat, 10 a.m. - 5 p.m.) or send us your questions by email to . We'll be happy to answer all of your questions. Hardware is an important part of percussion instruments. These accessories include essential instrument stands, instrument holders and pedals. The selection is always adapted to the type of percussion instrument. The exception is complete drum kits, which already contain hardware. Another important item is accessories that reproduce sound from electronic drums. This can be handled with or with headphones.a combo for an electronic drum kit, any active speakers or with headphones. Few people have perfect pitch allowing them to precisely tune instruments. Which is why we recommend using a drum tuner. For tuning you'll need a drum key to adjust the tension of the drumhead. 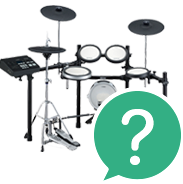 Don't forget about drum training aids. All drummers should practice with a metronome. Today's popular digital metronomes are very affordable and are usually equipped with a broad spectrum of programmable settings and many useful functions. You can also practice rhythm on special training pads that produce no sound but are great for practicing proper hand and wrist action. These pads are also used by professional drummer to warm up. 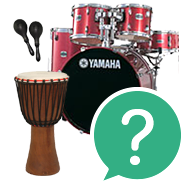 Mesh heads and drum mutes can be used to dampen sound while practicing. All drummers should protect their instruments with protective cases. We offer both soft and hard cases. Drum mats that prevent your drums from sliding on the floor are handy accessories. The hearing of active drummers is subjected to a relatively high noise burden. Protect you ears with earplugs or isolation headphones - some models work as an 'in-ear' monitoring system. Earplugs and headphones are also available in children's sizes. Drumsticks and replacement skins make up a special category of their own.